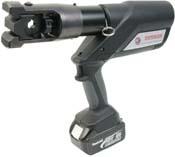 The Elpress crimp tool for the 1300 system (13 tons) has long been a favourite among users. The new PVL1300 tool can be used in the same crimp areas and with the same accessories, but, based on our vision of continuous improvement, we have significantly raised the level of user friendliness. The body has a new unique shape, ensuring perfect balance in the users hand. The 1300 system crimps Cu-terminals 10-400 mm², Al-terminals 16-240 mm² and C-sleeves 6-120 mm². The PVL1300 now has warnings in the form of a signal and flashing light if the correct pressure/full crimp is not achieved. A white LED light is available for dark environments and an option to read off data via an LED for service operations. The tools run on high-capacity Li-Ion Makita batteries and a Makita battery charger is included with a fast charging time of approx. 22 minutes.